On to Corregidor —Part VI – Fix Bayonets! Battery A moved to Corregidor on 17 February 1942. Remaining on Bataan was the Marine Air Warning Detachment, the USAFFE Guard, and Battery C. Disease became a significant problem: malaria began to take its toll, along with the heat and insufficient food to keep the Marines going. Washington relieved MacArthur of his duties in the Philippines on 22 February. Major General Wainwright assumed command of the newly designated US Forces in the Philippines (USFIP). The Japanese knew what they were doing: cleverly timed aerial bombardments kept the Marines from getting badly needed rest. After 24 March, air raids increased in their frequency; throughout the night, Japanese artillery harassed the Marines every 25 to 30 minutes. In one typical 24-hour period, two periods of shelling began at 0950 and 1450; six bombing raids began at 0400 and spaced throughout the day. PFC Kenneth R. Paulin of Company M was killed during the day by shellfire from the Cavite shore. Bombing raids ended at 2205, but began again at 0100. By the end of March 1942, rations had been reduced to 1,000 calories per day and Wainwright discovered that all food stores on Corregidor would run out by the end of June. He radioed to MacArthur in Australia, but there was nothing MacArthur could do. No ship could get through the Japanese line. 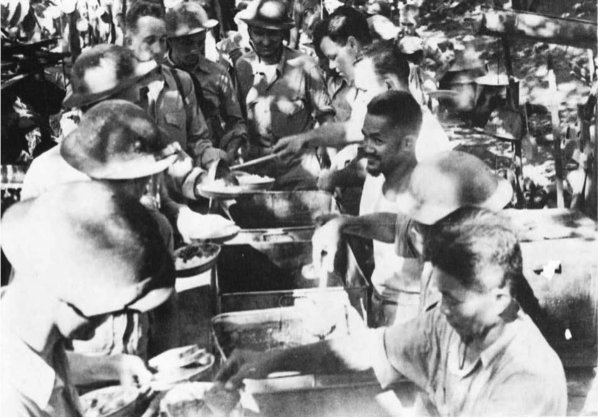 At the beginning of May, the defenders of Corregidor consumed only 30 ounces of food per day: 8 ounces of meat, 7 ounces of flour, 4 ounces of vegetables, 3 ounces of beans and cereals, 2 ounces of rice, and 3 ounces of milk. PFC Ben Lohman recalled that they ate mule meat whenever the Japanese bombing killed one of the animals. In the 4th Marines, some of the men had lost 40 pounds as a result of reduced rations and the stress of Japanese bombardments. Very slowly, the Marines were being deprived of the energy needed to resist the Japanese assault. 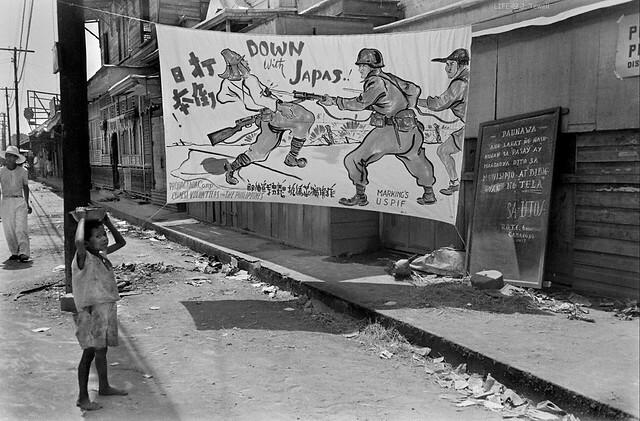 Bataan fell to the Japanese on 9 April 1942; 75,000 American soldiers were taken prisoner. As men subsequently became available from disintegrating units, they were integrated into the 4th Marines and assigned to support the beach defense. Fifty-eight sailors from the USS Canopus were organized into a reserve company and received training by Marine platoon sergeants. Ten Marines and an additional 40 sailors were added to the company after the fall of Bataan. The largest group of reinforcements involved 72 officers and 1,173 enlisted men from more than 50 different organizations —all of these assigned to the 4th Marines, which may have transformed the regiment into the most unusual organizations in the history of the Corps. They involved Navy, Army, Philippine Army, and Philippine Scouts. Ordinary seamen found themselves alongside Army engineers, tankers, and aviation mechanics. By the end of April, the 4th Marines numbered 229 officers, 3,770 men —of whom only 1,500 were Marines. Lieutenant Colonel Beecher now commanded 360 Marines, 500 Filipinos, 100 American sailors, and 100 American soldiers. He armed them with the 1903 Springfield rifle, hand grenades, Browning Automatic Rifles (BAR), four 37mm guns, and eight 30-caliber machine guns. A few mortars and .50 machine guns were also available from cannibalized ships. But all these weapons wouldn’t do these defenders any good if the troops became ineffective due to a lack of fresh water. we can never get enough inspiration from our troops my friend! thank you and sorry about u landing in the spam..I always fish u out! It is unimaginable what these men might have endured just to stay alive. Hunger thirst, disease… Continual harassing bombardment and artillery would in itself drive a human insane. Yet, they formed up to put up a fight. Unbelievable valor. Cull out any battle involving Marines Koji, you find this same valor. Indeed, sir, indeed. I am glad the Marines are on our side. Too bad for our enemies. My good friend, former Marine Carol Martin is fond of saying, “If you want to serve and defend America while a member of the world’s finest fighting force, join the United States Marine Corps. If you want to get shot and peed on, join the Taliban.” No one on the communist left understands what this means. Interesting. I was wondering if this is Japanese propaganda, because if Americans or Filipinos had made the sign, would they include Japanese script? Americans certainly never referred to Japanese as “Japas” … we either called them Japs or Nips. The Filipino word for Japan is Hapon. Notice too that the American soldier’s helmet is styled after the German helmet in WW II … we never got around to that style until the 1970s. Finally, we have to assume that both Americans and Filipinos would know that the acronym was USFIP (US Forces in the Philippines). What are your thoughts? Well, sir, I would certainly agree that if Americans had written the English, it would be Japs or Nips but I don’t believe it was written by Americans. And the helmets are unusual, yes. Also, of the four larger kanji at the left, one is not totally clear to me (日本打倒　‐にほんだとう) but this would be my guess: Down with Japan. The string of lower kanji – I have no idea. They just look odd; I don’t know what kind of characters they are. However, it does say Chinese volunteers. Perhaps Chinese/Filipino garb? Colonel Frank B. Quesada, USA (retired) has referred to these Chinese fighters as “Chilipinos,” but his usage is the first I’ve seen of it. My understanding is that early migration from China to the Philippine Islands occurred during a time when Spain wielded significant influence in the Orient, and continued through the mechanism of trade with China under the British. The numbers of Chinese immigrants to the Philippines under the British in China may have led to the terms “Anglo-Chinese” Colony of the Philippines; no doubt, this likely irritated the Spanish before 1898. After then, it did not matter what Spain thought. The Spanish referred to early Chinese immigrants as Mestizos de Sangley (Chinese Mestizos). After 1898, Chinese Mestizos began referring to themselves as Filipinos —indicating Spaniards born in the Philippines, as this distinguished them from Tagalog people, who were the native people. I take it the article was a translation but it was real interesting. So is it your opinion that this may have been made by the Chilipinos? I find the story of Wendell Fertig one of the more fascinating stories of World War II. I wondered if this signage could have been the handiwork of Fertig’s irregular forces, but he was at Mindanao and I think your friend’s site indicated that he believes this picture was discovered near Manila. Have you sent the picture to your friends in Army Intelligence to see what they know about it?